Think back to the past few weeks in the kitchen and ask yourself which vegetable was used most often. Chances are it was the onion. These suckers are the fundamentals of many recipes, adding a subtle but crucial flavoring to much of what we eat. Plenty of dishes start with the sauteing of onion, celery and carrots, forming what is called by its French term “mirepoix.” Yes, I have worked with many an onion in my time and look forward to many more in the future. Thank you onion, for your awesomeness. As amazing and functional as the onion is, it’s often not the star of the show. The onion serves as the background, the ingredient that helps other ingredients shine. In some meals people may not even know the onion is there. 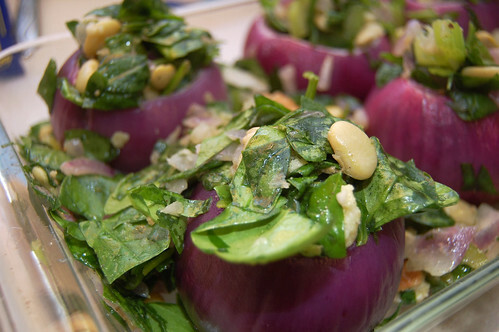 There are cases, however, in which the onion does take center stage, and these roasted stuffed onions are a perfect example. 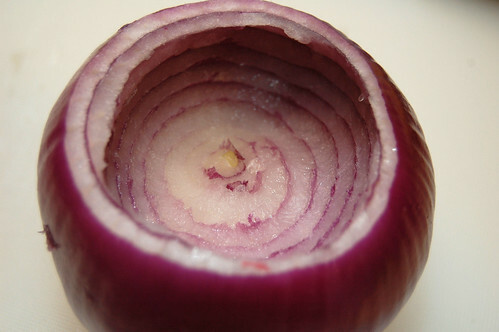 Onion shells: Cut 1/2 inch off the top of each onion and just enough from the bottom so it stands upright. Hollow out the onions using a melon baller; leaving all but 2 or 3 layers. I find the easiest way to do that is scooping out a bit from the center then working out to the edge. Once you’ve got the proper diameter, dig down a bit more and work out again. Repeat until near the bottom. Stuffing: While the onions are roasting, take about 2 cups of the scooped out onion and coarsely chop. Saute in a large pan over medium heat with oil, garlic, celery, salt and pepper for about 5 minutes; until soft. Combine with lima beans, butter and stock in a mixing bowl. Let cool enough to handle. Remove the onions from the baking pan and pour out any excess water. Stuff the onions with your filling until it is heaped up on the top. Take any leftover stuffing and place in the baking pan as “bedding.” Trust me, it’ll still be delicious. Bake onions for about 20 minutes or less, until heated through. stuffed onion? that sounds a wee-bit strong as a main course. Or is that why you stuff it with bread and beans? Some of the intensity is lost during the roasting process, but it’s definitely still there. Between that and the rest of the stuffing I think it works out well. The reds do tend to be a bit more pronounced, in my opinion.